California Vintners Embark On Asia-China Trade Mission | P&M Investment Inc.
SAN FRANCISCO – With growing sales in the Asian wine markets, a delegation of more than 40 California vintners will embark on Wine Institute’s international trade mission October 15-26 to six cities –Tokyo, Japan; Seoul, South Korea; Taipei, Taiwan; Ho Chi Minh City, Vietnam; Hong Kong and Shenzhen, China. The vintner group represents a dozen California wine regions which will present more than 110 brands at a slate of consumer, media and trade events. Last year’s 2011 U.S. wine exports, 90 percent from California, to the countries scheduled for the upcoming Asia trade mission were: Hong Kong, $163 million, up 39%; Japan, $105 million, up 39%; China, $62 million, up 42%; Vietnam, $21 million, up 266%; South Korea, $13 million, up 13%; and Taiwan, $9 million, up 21%. Wine exports to China have had exceptional growth for eight consecutive years, increasing more than 2,200% from $3 million in 2003. Exports for the seven months through July 2012 to China are up 14%, compared to the same time period for 2011. During the upcoming trade mission, special seminars on the Monterey wine region will be given in Tokyo, Seoul and Taipei by Rhonda Motil, executive director of the Monterey Vintners and Growers Association. Wine Institute and the U.S. Meat Export Federation are collaborating on a wine and food pairing seminar in Ho Chi Minh City. Participating California wine regions include: Napa Valley, Sonoma, Mendocino, Sierra Foothills, Lodi, Clarksburg, Livermore Valley, Monterey, Paso Robles, San Luis Obispo and Santa Barbara. 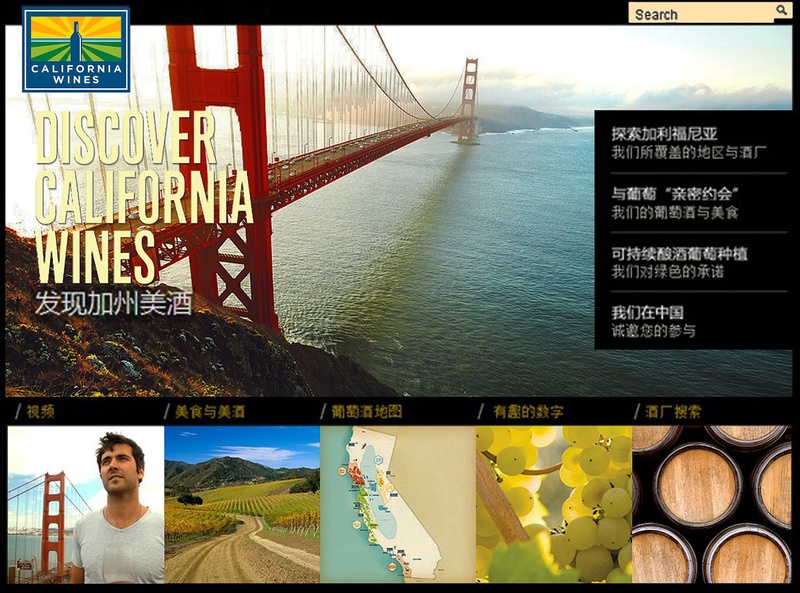 Wine Institute has also launched its official website for consumers in China: http://www.discovercaliforniawines.com.cn. The new website provides Chinese-language consumers with real-time information about California wineries and wine regions, highlighting the visually stunning aspects of California, its iconic landmarks, rural vistas, seasonal cuisine, and active, sustainable lifestyle linked to wine. The website is part of Wine Institute of California’s global branding campaign to help promote the state’s wine in China as well as increase tourism from China to the California’s wine regions. The new website for China is accompanied by the launch of the official Wine Institute of California Sina Weibo social media campaign: @加州葡萄酒协会 (http://weibo.com/cwichina). Chinese consumers can follow the Wine Institute Weibo to obtain the latest news and information about all aspects of California wines. Established in 1934, Wine Institute is the association of 1,000 California wineries and wine-related businesses that initiate and advocate state, federal and international public policy to enhance the environment for the responsible production, consumption and enjoyment of wine. California is the fourth largest wine producer in the world, producing 90 percent of all U.S. wine. Each year, more than 20 million tourists visit wine regions throughout the state to explore and enjoy the wines, the cuisine and cultural offerings associated with California’s signature industry. Go to: www.discovercaliforniawines.com.cn for more information in Chinese and www.discovercaliforniawines.com for the English language version.